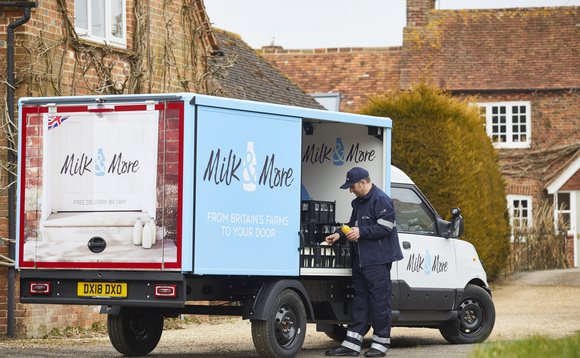 Milk & More, the doorstep delivery firm, is due to be expanding its UK delivery fleet to 500 EVs by the end of next month. It has claimed it is on course to become the largest operator of electric vehicles (EVs) in the UK, after it completes the rollout of another 160 new battery-powered milk delivery vans by the end of next month. The new vehicles have a range of up to 125 miles on a single charge, bringing the company’s UK fleet of EVs to just over 500, traveling an estimated 14 million miles a year delivering milk and groceries to households up and down the country, it said. Moreover, the electric delivery vans will save an estimated 3.4 million litres of diesel per year, as well as being far quieter than traditional fossil fuel vehicles, enabling the firm’s 1,100 milkmen and milkwomen to deliver to customers’ homes by 7am with minimal disturbance, it explained. This is the latest environmental move from Milk & More, after the company phased out one-pint poly plastic milk bottles and replaced the 1.75 million plastic bags it uses each year with paper bags. In addition to food and drink deliveries, the company is also expanding its range of eco-friendly household products, and aims to ensure 100 per cent of its packaging is reusable, recyclable or compostable by 2025. Furthermore, Milk & More not only delivers the vast majority of its milk in one-pint glass bottles, it is also working on a project to increase the average number of times these are reused from 25 to 30. Andrew Kendall, deputy CEO for Milk & More, said the company was “transforming the great British milkman into a modern, convenient delivery service which has a sustainable, environmentally friendly proposition at its heart.” “We are continually looking to reduce our environmental footprint, so customers can be assured that they are buying into a business that is fully committed to a sustainable circular economy,” he added.